Savannah staff volunteered their time to operate a Bingo at the Georgia Infirmary Adult Day Center, a facility which helps elderly and physical disabled live independently and is designed to help avoid or delay nursing home placement, decrease hospitalizations and emphasize preventive health care. 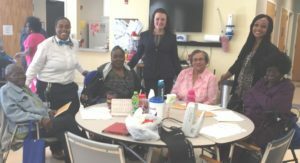 Staff, which included (standing from left) Resident Monitor Renee Williams, Social Services Coordinator Jamie Hoff, and Assistant Director Ashley Thompson, called numbers, assisted the 30 participants and provided an upbeat atmosphere. Coffee cups were given as prizes.